I love this beautiful image and have been wanting to make a card with her. Cut a piece of purple cardstock to fit the center of the card. Went around the card and purple cardstock with distress ink. 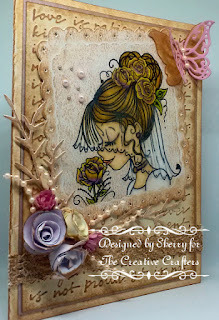 Embossed a piece of ivory cardstock and went over it with distress ink. Cut the image out with a frame die, then went over it with distress ink. Taped the purple cardstock to the center of the card, then the embossed cardstock. 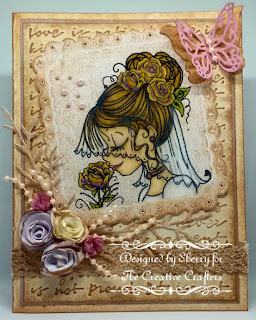 Cut a piece of lace tape to go across the card, went over it with distress ink. Attached the lace tape across the card. Die cut two ivory pieces of greenery and went over them with the distress ink. Glued the greenery pieces onto the card. I made my own larger rolled flowers and added distress ink on some of the petals. Die cut two pink small flowers, then glued all flowers onto the card. Cut pieces of string pearls and glued them coming from beneath the flowers. Die cut a pink butterfly, then traced around it on ivory cardstock for behind it. Used distress ink on the ivory butterfly after I fussy cut it out. Glued both butterfly pieces onto the card and glued a string of pears on it. Then glued some flatback pearls onto the card. The challenge runs from June 15th to July 8th. Terrific card and I love the image. Cute! Beautiful card and lovely colours and colouring. Hugs Mrs A. Stunning card. Love your coloring and the embellishments.